We pulled the rollaways onto the porch around 11:00 p.m. It was hot, over 100 degrees yet, and humid, but worse than that, it was still. The clouds above were thick and heavy and promised rain, but broke their promise with an obstinate shrug. A full moon failed to punch through the clouds, but its light shown as if behind a thick curtain and the sky looked bruised and the light looked soiled. We tried to sleep. At 1:00 a.m. I woke to the sound of all-terrain vehicles tearing up the dirt roads near us. They stopped at the corner. About ten minutes later a truck drove up the dirt road and stopped at the same corner. I’d heard the truck from two miles away, from where the pavement ends and the dirt road begins and the washboard rattles up through your bones and you think to part your teeth in your mouth because it feels like if you don’t your teeth might break. From two miles away I could hear the tools, or the metal scrap, or both, clanging around inside the truck bed. 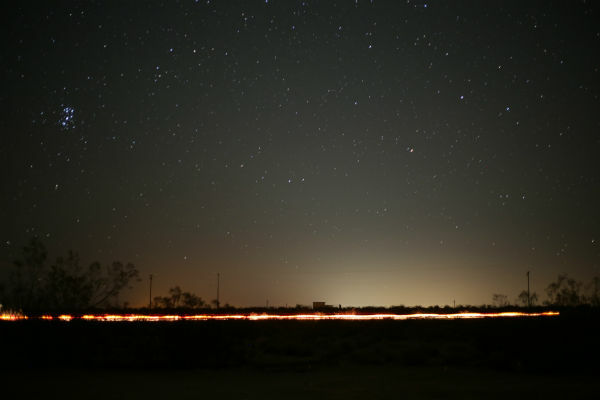 A car travels down a dirt road on a clear night, with a long exposure. By Ben Gould. Sound carries at night in the desert. I’ve listened hard to conversations a quarter mile away and heard snippets of things I should not have been privy to. I know more about coyotes than I’m sure they want me to know. Why people drive out to that particular corner so close to a great nothing, I have no idea. It only makes sense in some logic of despair, some logic that depends on a lifetime of careless losses, and unpredictability, perhaps made personal with a festering grudge, a despair that can only be broken out of with violence of one sort or another. I watched the vehicles from the cover of my porch until they drove off and I lay down again. A breeze passed through as if it were lost or scared. I wanted it to stay so badly that my lips were moving. I heard tiny taps on the metal roof. They continued. I stepped off the concrete porch into the sand but didn’t feel anything. Could rain fall on the roof but evaporate by the time it got to me two feet below? When I opened my eyes again it was still dark. 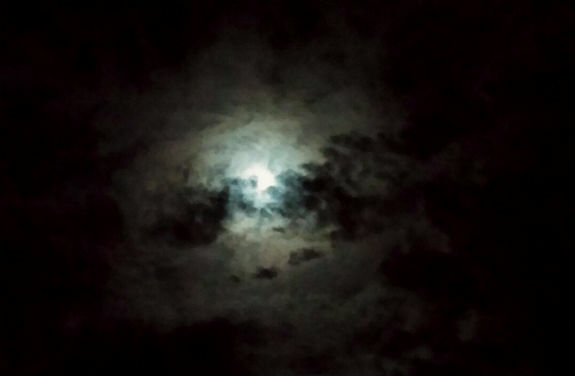 The moon sat directly overhead behind the thinnest veil of clouds. Then it broke through and the sand brightened white and glittered like snow, reflecting light back up to the sky. I looked across to our native plantings, brave and stoic inside their cages. They looked like abandoned suitcases on the tiled floor a train station, out of place and self-conscious. A young mesquite tree stood alone at the end of the porch, its two slender trunks rising to a feathery canopy, looking much like a ballerina en pointe, spotlighted under the moon. A few hours later I felt chilled and tugged at my sheet, trying to cover my shoulder. Half-awake I closed my eyes tighter against the dawn and savored the pocket of cold air that the rising sun pushes forward before it takes over the day shift. I tried to memorize the chill because I knew I’d need that memory later when the heat and humidity made me panic and consider fleeing this place for the summer, like other people with more means and sense. Every day in the desert heat is lived singly and no one person on any one day can say decisively what will happen next, or may draw a moral from it. In the heat of the day we listen to each other with a little more patience, and overlook the forgotten words and names, the delays, the repetitions, and sometimes we just stop talking altogether, being in the same boat and all, sunbeaten, and just wait out the heat.